Window boxes and pots are a fab way of spicing up the look of your garden. Window boxes are also not just restricted to windows – these can be mounted onto any wall or fence. When planting your boxes and pots, timing is crucial. Summer containers should be planted in Spring, preferably from April onwards, however these plants will need protecting from the frost until the end of May. For winter containers, these will need to be planted between September and October. For herb containers, these are best planted between April and July, but again like the summer containers, these will need protecting from the frost until the end of May. It is important to ensure that your containers have adequate drainage so your plants do not become water-logged. Ensure that the containers have good drainage holes and add a layer in the bottom to provide a good drainage layer. Crocks (broken terracotta pots) or gravel are the most common solutions for this, however you can also line the bottom of your pots with chunks of polystyrene. As most plants come in polystyrene containers, this is a cost-effective solution as you can break down the containers the plants have come in and use those before planting them. Terracotta pots should be lined with something like a plastic bag as terracotta is porous. This will minimise the amount of water that is lost from the soil. The layout of your plants is also important to bear in mind when setting up your containers. Taller plants should be arranged in the centre of containers that are going to be viewed from all angles. If your container is going to be placed against a wall, you will be better off positioning the taller plants at the back of the container. This is done so that the taller plants do not dominate the smaller plants. You should also leave enough space between and around the plants. Trailing plants should be positioned around the edges of your containers so that they have enough room to cascade down the side of the container. When potting your plants, watering them in their original containers about an hour before transferring them to your new containers will help to ease the “transplantation” shock for the plant. This will also aid the removal of the plants from their original containers. You should decide where you are going to position the container before you start planting. If you are using a large container, it will become heavy to move after planting. Using a good quality potting or container compost, fill your container to approximately 2cm (just under an inch) below the rim of the container. Arrange your plants in the container before planting them to ensure that you are happy with the layout before planting. Once you are happy with the position of your plants, make holes in the compost using either your hands or a trowel. These holes should be the same size as the root ball of the plant. Carefully remove the plant from its original pot – do not do this by pulling the plant straight out of the pot as you run the risk of damaging the plant. Watering the plants will help make this easier for you. The best way to remove a plant from its original container is by placing your hand at the base of the pot and turning the plant upside down, using gravity to assist the plant easing out of the pot. If the plant does not slide out easily, gently tap the pot against a hard surface. Once the plant is removed from its original pot, gently firm it down into the holes you have made in the compost. Once all the plants are in position, firm the compost around them to hold them into place and fill any gaps with more compost if required, before generously watering your pots. Finish off by dressing the top of your pots with decorative gravel or slate chips. This will help the compost to retain moisture and will help to deter weed growth and slug infestations. 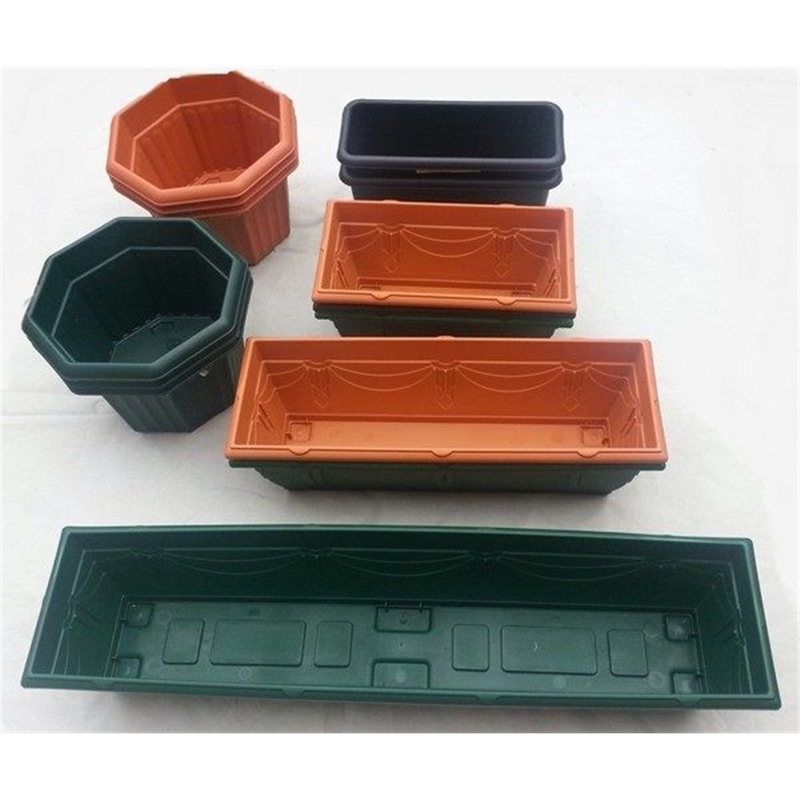 How you treat your pots and boxes after planting is vital to ensure that you are bringing out the best of your plants. Top soil should be replaced in early spring to give your plants renewed nutrients for the new season. Remove any dead or dying flowers – this will encourage new flowers to bloom and ensure that your container looks fresh and healthy for longer. Your containers will need regular watering – remember to increase the frequency that you are watering them in hotter and dryer periods of the year. Your plants will be more-or-less completely reliant on you to supply the right amount of water to them so make sure they are not neglected during periods of drought! Water retaining gels and granules and help with water retention. Rotating the position of your containers will give your plants equal sunlight coverage and even growth. Regularly check and pests of diseases and treat any infestations with the appropriate insecticide or fungicide. It is advised to use a good quality food or fertiliser when feeding your plants, due to the fact that they will not be getting the nutrients that are naturally present in the earth. Some modern composts contain slow-release plant feeds that will keep your plants fed for up to six months after plants. If your compost does not contain these additions, you will need to start thinking about feeding your plants about five to six weeks after planting. If you prefer to only feed your plants once a season, you can purchase plant food tablets that can be pushed into your compost for a slow release feed. However, if you prefer to feed your plants regularly, use a soluble plant food.